The latest lineup from Jeep is a driver's absolute dream for SUVs. The Grand Cherokee is packed with interior upgrades and tech features that will make it easier than ever to drive safely and comfortable. With high-grade materials inside, lots of room, and a spacious cargo hold, you can carry just about anything in the Jeep Grand Cherokee. It's incredibly stylish, whether you start at the base or add on some of the premium features. 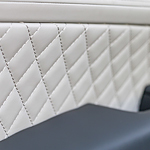 You can always upgrade to leather upholstery, leather seating, heated seating, and much more. The cargo room is great as well with more room that you can add with removable second row seating. Infotainment has been updated to include all new features for Apple CarPlay and Android Auto, as well as voice controls. You can do everything hands-free in the new Grand Cherokee. Want to test drive the all new Cherokee? Head to Riverland Chrysler Dodge Jeep.